Nova Scotia, Newfoundland, and New Brunswick are provinces with stunning scenery, captivating coastlines, treasured traditions and wonderful wildlife that will take your breath away! On this 10-day tour, hike to the summit of the incredible Gros Morne Mountain, explore the beaches and trails of Cape Breton Island, observe humpback, minke, pilot whales and more on a whale watching cruise, kayak through the amazing fjords in Norris Point, and get “Screeched in” on George Street, St. Johns. After a friendly welcome from your guide, head towards the Cape Breton Highlands, which are home to Canada's Scottish heritage. You’ll hike the famous Skyline Trail. Stay in a hostel located on the Cape Breton Road. (Dinner included). This morning, you have the option to take an amazing whale watching tour in the Atlantic Ocean (own expense). Drive along the Cabot trail and stop for an easy hike up the Skyline Ridge. Spend this evening beside the lake and roast some marshmallows at the campfire. (Dinner included). Board the ferry to Newfoundland (6 hours). Drive to Norris Point, a picturesque coastal community located near Gros Morne National Park. Take advantage of the many optional activities available, including sea kayaking, boat tour through freshwater fjords, or the famous hike up Gros Morne Mountain. In the evening, relax and enjoy dinner cooked by your guide. (Dinner included). Spend time hiking in Gros Morne National park before you drive to the town of Botwood. Botwood is centered around its sheltered, deep water port. 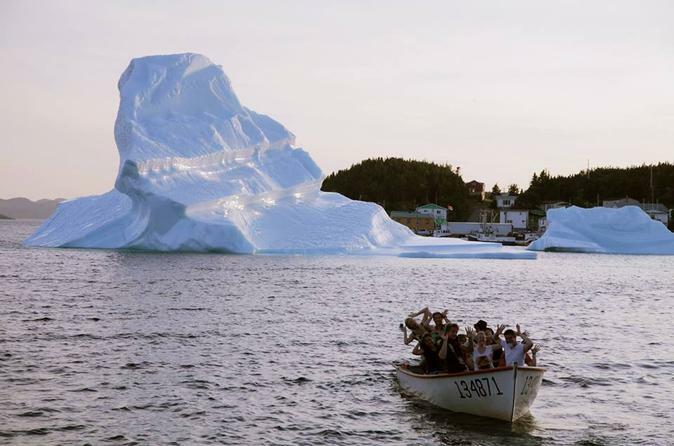 Depending on the time of year, you may be able to see some magnificent icebergs floating by. At night, you'll have a group meal at the hostel (included). Continue your drive through the Bonavista Peninsula to a small town called Trinity East. Here, you'll explore the area by walking the famous Skerwink Trail. After a full day of hiking, enjoy a relaxing group dinner. (Dinner included). Stop at St. Johns, one of North America’s oldest cities. Join your guide for a city walk and then relax (or party) with some drinks on George Street which is known for its many pubs and bars. This is your opportunity to get “Screeched in” at a local pub! Enjoy a free day in St. Johns. On the way back to the mainland, take note that this area has the world's largest puffin colony, the world's southernmost caribou herd, and some of the world's oldest and rarest marine fossils. You will board the ferry in the early evening for an overnight adventure across the sea! Journey back into New Brunswick today and stop to take a tour of Hopewell Rocks, where you can see and learn about the incredible tidal changes which are some of the largest in the world! Tonight, join your guide for a city walk and night out on the town!